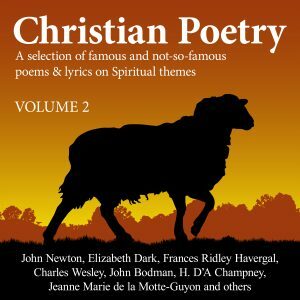 63 poems by various authors including, John Newton, Elizabeth Dark, Frances Ridley Havergal, Charles Wesley, John Bodman, H. D’A Champney, Jeanne Marie de la Motte-Guyon and many others. This Volume contains 63 Poems by John Newton, Elizabeth Dark, Frances Ridley Havergal, Charles Wesley, John Bodman, H D’A Champney, Jeanne Marie de la Motte-Guyon. 23 Who is on the Lord’s side? 24 Why should I complain? 25 He Maketh the Storm a Calm. 29 What think ye of Christ? 49 It passeth knowledge, that dear love of Thine! 51 And can it be?